Using concealer makes the difference. If you can get away with a sheer base, well concealed blemishes and under eye bags your skin will look far more natural and perfected then a full coverage foundation all over, now of course there is a time and place for that I love a full coverage now and again but as the days are warming and the layers are reducing let's freshen up our base and get the concealing down. Now I am no expert - clearly, however these products really work for me so hopefully they may just do this same for you. For blemishes and redness I use that good ol' Collection Lasting Perfection Concealer in light, it is probably the cheapest thing in my make up collection and it's well due a replacement as this tube is rank but it works. For a all over base I do tend to stay away from the cheaper brands but for some reason this concealer nails it; not cakey, full coverage, long lasting, easy to blend - what more do you want? I wouldn't use this under my eyes as for me it is a bit heavy but for pesky pimples look no further. For my eyes it's not quite as easy - everything creases. 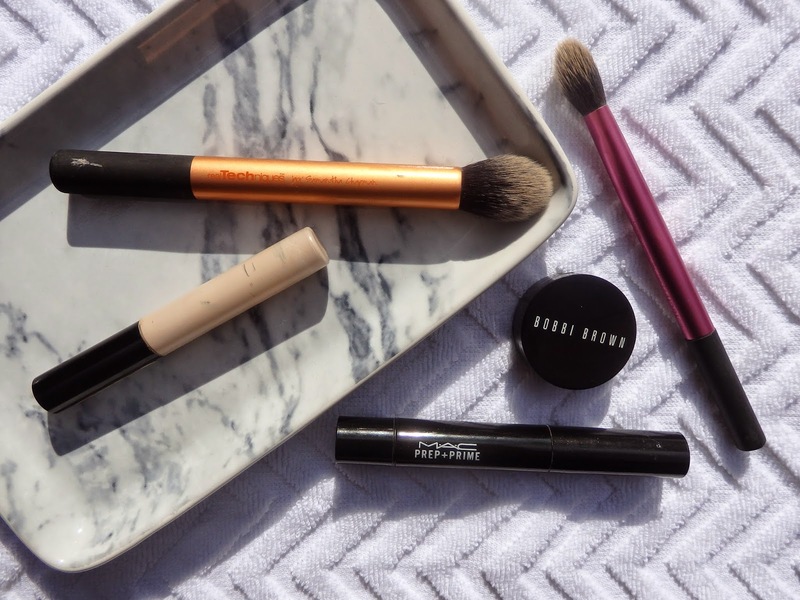 This duo is most 'crease ressitant' I have found, the Bobbi Brown Corrector in light bisque is a long time favourite, I believe this is number four and I am nearly ready for a new one. This cancels out my 'tired' blue bags, they aren't that bad so if that is something you struggle with you'll have to test it for yourself. On some days I only use the corrector, due to the shade I use it's not overly peachy or pink so it looks fine but do be careful with some corrector shades and they can look a tad crazy on their own. Over the top to brighten I use the MAC Prep + Prime pen in Light Boost, this pale yellow shade lifts and brightens as well as covers - it's what YSL touche eclat should be. This product really impressed me, I find with any of these pens you have to sacrifice coverage for brightening or vice versa but not with this baby. I also find synthetic fluffy brushes work best for me, above is the Real Techniques contour and setting brush.